"Tacos always keep the family running home for dinner. 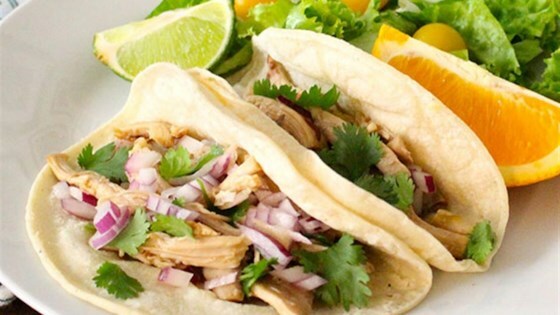 Here's a new take on classic pulled chicken tacos, with a hint of sweet orange, tangy lime and savory soy sauce. There's minimal chopping and prep work, so you can get out of the kitchen fast. Use a slow cooker liner in this recipe to make clean-up even easier." Line a 4-6 quart slow cooker with a Reynolds(R) Slow Cooker Liner. Trim any large pieces of fat from chicken thighs. Season chicken with half the salt and pepper; add to slow cooker. Add onion, garlic, jalapeno, orange juice, lime juice, soy sauce, cumin, and the remaining salt and pepper to slow cooker. Stir gently with a wooden or silicon spoon to combine. Cover and cook on high setting for 2 to 3 hours or low-heat setting for 4 to5 hours, until chicken is done. Carefully remove lid to allow steam to escape. Use slotted spoon to transfer chicken to a large bowl or cutting board. Shred into bite-size chunks. The chicken should easily shred when it is cooked through. Ladle out some of the juices from the slow cooker, leaving enough to mix with shredded chicken. Spoon shredded chicken back into lined slow cooker. Season to taste with additional salt, pepper, and cumin, if necessary. Warm tortillas in oven or on stove top. To serve, top each tortilla with shredded chicken, diced red onion, chopped cilantro, and a squeeze of fresh lime juice. * Remove the jalapeno seeds if you prefer it less spicy. Low Carb Variation: Use lettuce leaves instead of corn tortillas. Reynolds Kitchens Tip: Slow cooker liners will save you time in the kitchen with minimal clean-up, giving you more time with your family. I make this recipe exactly as directed & it's amazing. I have since passed it off to numerous friends, who like me, make it almost every single week. Love love love. Really tasty! Wasn't sure about the orange juice, but it added great flavor.